At the beginning of each season as the fruit and vegetables begin to appear in the shops and markets there's that delicious transitional period of rediscovery. I dig out my cookbooks, search for new and different dishes to make the most of the produce that's not been around for a while. Last week saw roasted figs with gorgonzola and a honey dressing, roasted corn pudding in acorn squash (thanks to Heidi of 101 Cookbooks), corn on the cob dripping with butter and freshly ground black pepper, leek & gruyere tartlets and plum crumble. That's just for starters. A drop in the ocean. The post-it notes littering the pages of my favourite cookbooks forecast a lot of time in the kitchen over the next couple of months. Why is Autumn so short?! Last week Mat Follas, winner of Masterchef, who runs the restaurant The Wild Garlic and writes a lovely blog of the same name was touting for vegetarian suggestions for his Christmas menu on twitter. I like the fact that Mat asks people what they would want. He really values people's input - asking Guardian Word of Mouth readers to comment on his first menu for example. That way he canvasses opinion, encourages debate, gets some new ideas and (hopefully) comes to a much more considered decision on any number of things. So with Christmas menus on my mind, and armed with some fantastic homegrown potatoes freshly dug up from FoodUrchin's allotment (which, I was reliably informed, made great roasties), I set about a Sunday roast for two. Chicken for Andrew and a seasonal veggie dish for me. Now, when it comes to a roast, I do not want to be missing out on those delicious roast potatoes, crispy roasted parsnips and lashings of gravy. I hate it when I go somewhere for a Sunday roast only to find that the veggie option is pasta or risotto. What's that all about? What can be so difficult about cooking something interesting and appetising and vegetarian to serve with the same veg as the beef, chicken or lamb? 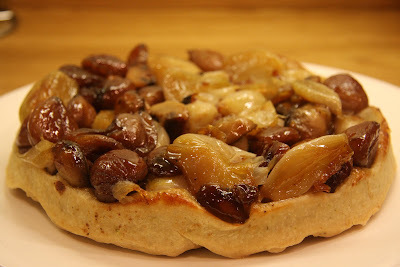 With a truck load of shallots in my Abel & Cole delivery that I wanted to use up I decided on a savoury tarte tatin. I've made them before - a Tomato Tarte Tatin earlier this year with the first crop of the Summer tomatoes and a vegan Shallot & Wild Mushroom Tatin for Christmas dinner a few years ago when my Uncle and Aunty were visiting. All the talk of Christmas had whetted my appetite for chestnuts, so a Caramelised Shallot & Chestnut Tatin with porcini gravy it was. First make the pastry by rubbing all of the ingredients except the water together to form fine breadcrumbs, then add the water a little at a time until the pastry comes together (being careful not to overhandle it). If you have a food processor, put all the ingredients except the water and blitz for around 40 - 60 seconds and then with the blade running add the water slowly until the pastry forms a ball. Wrap in clingfilm and pop in the fridge for 30 minutes. Peel the shallots. Heat the butter with a tiny splash of olive oil in a tarte tatin dish over a low heat (or another dish which you can use on but the hob and in the oven) and saute the whole shallots over the until they begin to brown slightly. Turn the heat up slightly and add the mushrooms, seasoning and thyme and cook until the juices which come off the mushrooms have evaporated. Add the sugar and cook for another couple of minutes and then finally add the chestnuts. The mixture should cover the whole of the bottom of the tarte tatin dish. Roll out the pastry which has been resting in the fridge to about 1/2 inch thick and lay over the shallot mixture. The pastry should be a touch larger than the dish so fold the edges back and tuck well around the edges to form a seal and keep the moisture in. 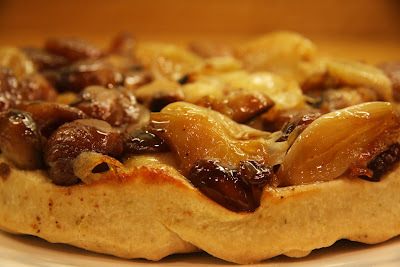 Pop the tarte tatin in a medium oven for around 30 minutes or until the pastry is cooked and golden. Slide a knife around the edge of the pastry to loosen. Put a plate over the dish and then carefully tip the dish with the plate held firmly on top over so that the tart is sat shallot side up on the plate. Remove the dish. Serve with roast potatoes, veg and your favourite vegetarian gravy. N.B. To make this dish vegan, use vegan margarine (e.g. 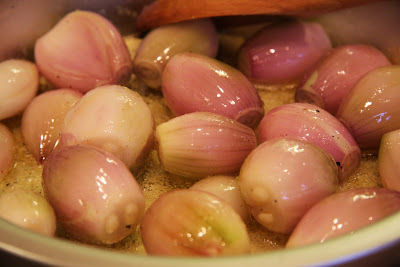 soya margarine) instead of butter in the pastry and use just oil (not butter) to saute the shallots for the filling.